The past few weeks of my semester have been jam packed with adventures and activities. I have been scrambling to complete assignments and the edTPA, visiting friends in Michigan, and exploring further what it means to be a student teacher in an urban setting. My weeks here in the city of Chicago are dwindling, however the busyness continues. 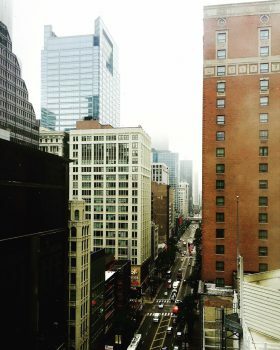 As this semester progresses, I continue to reflect on my experiences here in Chicago. Below are a few of my reflections from the past two weeks. First, and most importantly, student teaching. Student teaching is the reason I am in Chicago, and part of the reason for my exhaustion. Though student teaching is a wonderful experience, it is not an easy task. Each week for class with my wonderful, loving, and generous fourth graders, I prepare 25 lesson plans, and countless resources. Needless to say, this experience has stretched me more than my schooling leading up to this has prepared me for. It feels as though my mind is constantly running in 12 different directions, while I attempt to juggle multiple tasks. That being said, if you know me, you know I got a B in kinesiology in college for not being able to juggle. That should help you to visualize how the semester is going. All joking aside, student teaching has just been a simply wonderful experience. This week in my classroom I was able to speak with the diverse population of students and have the pleasure of teaching about the presidential election. The students, 98% of whom are considered minorities in this nation, feared the outcome of the election, unsure of what this could mean for their futures. After a time of discussion, lament, and reflection, my students were better able to process their many emotions. This opportunity, though avoided by some, presented a wonderful opportunity in the classroom to speak about respect, justice and love for all people in our nations, including those who don’t often show these values. I feel blessed to have had the opportunity to speak openly with passionate fourth graders about topics that resonate so close to the hearts of many in our country. Someday, I know my students will teach my generation what it means to love and serve justly. Moving away now from the student teaching aspect of Chicago semester, an amazing thing happened this week… I completed my edTPA! This multistep assessment has been a constant burden on most of the student teachers in Illinois. Completing question after question on this assessment seems tedious, and takes time away from what we all want to be doing, bettering ourselves for our students. All this being said, having the edTPA completed alleviates much of the stress and exhaustion that has been weighing on me recently. Have no fear, these last few weeks of student teaching haven’t been all deadlines and requirements. I managed to squeeze socialization and exploration into my schedule as well. Last weekend I had the opportunity to bring my roommate Jess on her first visit to Michigan, where I go to school. 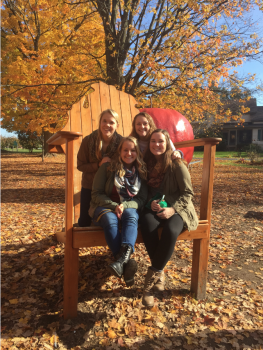 While visiting Michigan, we visited friends, explored apple orchards, and crunched fall leaves (a task I have greatly missed since being in Chicago.) This break from the city, and many of the requirements that needed to be completed, allowed an opportunity to recharge. This was much needed after the busiest two weeks of student teaching yet!